SAG Awards special: Amber wearing a special detailed Anne Barge gown. This gown was originally a wedding gown but it was made specially for Amber and looked stunning on her. Amber Riley in Ema Savahl Gown: Grammy Awards; Many people had mixed feelings about this dress but I absolutely loved it. I do believe if the necklace would have covered both shoulders it would have been better, but I still believe the tailoring and fit was perfect. Golden Globe Awards: Amber wearing a Oliver Tolentino shimmery one shoulder fitted gown. Amber Riley, Nicey Nash and Julia Pace Mitchell definitely stepped out at the NAACP Image Awards wearing some fabulous gowns. 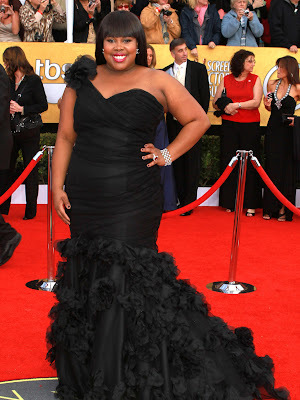 I am a huge fan of Amber Riley's fashion because recently her awards gowns have been simply amazing. I love what she wears every time she steps out on the red carpet. Nicey Nash surprised me with her outfit because I wasn't expecting such a bold choice for her, but I have to say that I did love the dress. Julia Pace Mitchell looked fabulous in her gown, but I would have liked to her to accessorize a little bit better but other then that I loved the fit and the flow. I love amber riely's style on the red carpet, she looks great. Wow, that Ema Savahl Gown looks gorgeous on her!